One pound of terrifically hot oleoresin capsicum (oc) spray. Fog pattern output ensures you hit everything in front of you. Shoots 20 feet to blast, soak and demoralize any group of men or animals. Base chemical formula of 2 million SHU heat. The biggest size you can get without going institutional. Firemaster spray nozzle erupts the contents into a big powerful Fog like a fire extinguisher. Safety pin to prevent accidental discharge. Gun handle nozzle design to help you control the output with accuracy. Dynamite product made in the USA. Fits the belt and leg holsters we have shown below. Notice: This is an aerosol and cannot be shipped by air, ie, no 3 day service. A physical (street) address is needed. Please note that any pepper spray must be shipped by Ground. Any order that includes pepper spray will be shipped UPS Ground unless you specifically ask to split the order and ship the other items by air. 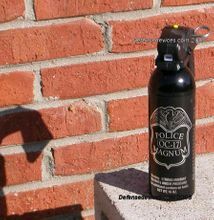 We cannot ship this pepper spray to WI, NY, MA, HI, AK or APO addresses. Police Departments need to submit their request on department letterhead (fax: 888-345-2533).